A new round of Syrian peace talks has been scheduled to begin in Geneva on the 25 January. This time the question is not if women shall participate in the talks, but how they shall be included in the process. In this article, we investigate how the women civil society can participate in the talks. Syrian women groups and activists have been calling for their effective inclusion and participation in the UN lead Syrian peace process since 2013. They have continued to develop positions and recommendations for a peaceful solution of the conflict, calling for the protection of as an absolute and immediate priority. Women civil society groups are a key actor for the protection of civilians, combating extremism and promotion of nonviolence and they should be supported on a long-term basis and given a key role in the peace talks. The question is not if women should participate in the upcoming peace talks, it is how they must be included in the process at all levels. As Syria is moving into its 6th year of unimaginable civilian suffering and conflict, a new round of Syrian peace talks has been scheduled to begin in Geneva on the 25 January 2016. Recent disagreements among the key international stakeholders on the members of opposition delegation might delay the process further. This is despite the recent display of international unity over a crisis that has divided major powers. The international commitment to find a political solution in Syria was renewed with a unanimously adopted Security Council Resolution to focus exclusively on the political solution in Syria on the 18 December 2015. The Geneva Communiqué of 2012, as well as the Vienna statements by the International Syria Support Group (ISSG) in 2015, have both recognised the importance of women’s groups participation in all future peace negotiations, transition processes and the eventual implementation of final agreements. Why should women groups participate? Women now represent more than 50% of the Syrian population, and on this basis have the equal right to participate in peace negotiations. Women tend to take a human security-oriented approach. This includes clear, coordinated, and consistent requests by women pressing for firm commitments on immediate human security needs that concern the entire society. Women’s groups have historically been excluded from peace talks; empirical evidence shows that the more inclusive peace and transition processes are, the more likely it is that final agreements will be reached, effectively implemented, and sustained in the long-term. The meaningful participation of women’s groups during official political negotiations (Track 1) may act as an effective link with the grassroots level (Track 3), facilitating the diverse representation of traditionally-excluded local interests, needs, and viewpoints. Organised women’s participation and meaningful influence strengthens the legitimacy and overall credibility of peace negotiations and transition processes at all levels. Women know and understand their own needs, and the needs of their local communities, better than anyone else, without participation these urgent needs may be neglected. So, the question is no longer if women should participate in the peace talks but how. Participation or influence of women civil society organisations across various phases of a peace processes has become more visible in recent years. This includes development of the international normative framework justifying the meaningful participation of women in all aspects of a peace process. It also includes formal structures through a variety of modalities of participation. As resent research has shown, this has in practice enhanced the likelihood of peace agreements being signed and implemented, but only if these groups were able influence these processes in a meaningful way. Throughout the ongoing Syrian peace process, civil society and women’s groups have made many initiatives to engage at all levels (local, national, and international), and in both formal and informal processes, to support the resolution of this complex armed conflict. Consequently, over the past five years, these groups have built up substantial capacity and invaluable experience. They maintain strong motivation and willingness to continue engaging in the formal intra-Syrian peace talks. The official framework, or format, of these peace talks has not yet been disclosed or finalised. However, based on clear requests by Syrian civil society and women’s organisations, a formal structure for their participation has been envisaged in the early stages of these talks. How could the Syrian women civil society best influence the process of the upcoming peace talks? With mediators and supporters directly engaged in the negotiations: by increase women mediators to get a gender-balanced envoys and teams and in the International Syria Support Group, increase women’s participation among member state delegations. Formally-attached to the negotiations: officially-endorsed civil society consultative forum, 50% women’s quota and officially-endorsed broad-based public consultations inside and outside of Syria with women’s participation. In addition strengthen and increase support for the informal processes around the negotiations: by ensuring women’s participation in track 1,5 initiatives, support advocacy campaigns, lobbying at the national/ international levels, ensure mass-mobilisation efforts to build movements, including media and online social media campaigns and support to grassroots initiatives and organised campaigns. The need for women’s wider participation in peace processes can no longer be perceived as a mere normative demand; in fact, recent studies have shown that including women in peace processes increases the probability of reaching a long lasting peace agreement by 35%. Thus, there is strong correlation between women’s inclusion and higher likelihood of reaching agreements, and that shatters common assumptions claiming that women’s inclusion may negatively impact the course of peace processes. It is also important to state that ensuring a higher number of women involved in peace processes is not sufficient on its own; it is essential to combine it with meaningful participation and stronger influence of women on the process in general. 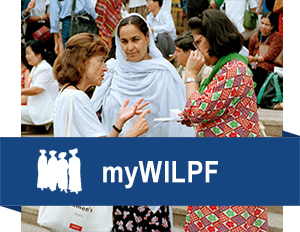 WILPF’s Crisis Response programme will be monitoring the Syrian Peace Talks in Geneva – if the talks start. Follow this blog to stay updated and don’t forget to check our facebook and twitter accounts.